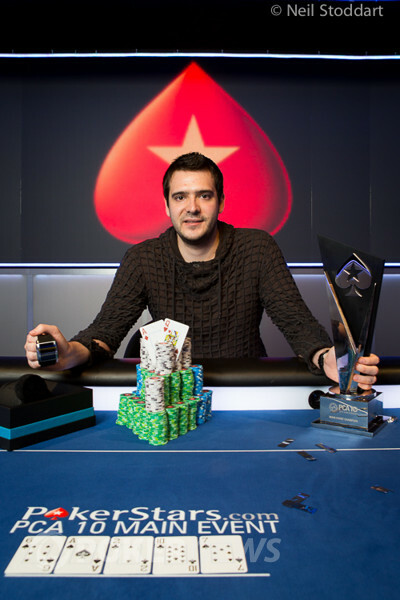 Dimitar Danchev - 2013 PCA Main Event Champion! After a grand total of 987 entrants, seven grueling days of battle on the felt, and a final table that lasted roughly seven hours, the 2013 PokerStars Caribbean Adventure Main Event has finally come to an end. When all was said and done it was Bulgarian Dimitar Danchev who was able to capture the title and the $1,859,000 first-place prize that accompanies it. Danchev was able to best fellow professional poker player Joel Micka heads up to claim the title. This makes for an historic conclusion to the 10th anniversary of the PCA as Danchev has become the first Bulgarian to take down a major title on the European Poker Tour. The road to the final table was not an easy one as a total of 987 entrants showed up for the shot at becoming the tenth PCA Main Event champion. The event held two starting flights that saw a slew of professional poker players and notable names hit the felt. Well known pros Barry Greenstein, Jean-Robert Bellande, Tom Dwan, Ben Lamb, and Team PokerStars Pros Jason Mercier, Marcel Luske, Mickey Petersen, Bertrand "ElkY" Grospellier, and Shane Schleger are just a small sample size of the players to fall on their first day of play. Day 2 saw the field whittled down to 166 as names like Phil Ivey, Jonathan Little, Chris Moorman, Tom Marchese, Erik Cajelais, Cherish Andrews, and 2012 PCA fourth-place finisher Xuan Liu found themselves without chips before the time of the final level ran out. Those to survive Day 3 officially earned a tournament cash for their efforts. Players like Greg Mueller, Carlos Mortensen, Scott Clements, and PokerStars Team Online member Tatiana Barausova all earned a cash but were eliminated before the tournament wore down to its final stages. 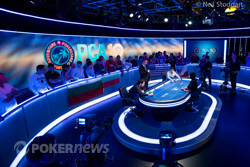 After several grueling levels of play over the course of Days 4 and 5 and the eliminations of such names as Eugene Katchalov, Joe Serock, Mohsin Charania, Olivier Busquet, Eddy Sabat, Darren Elias, and Robert Mizrachi, the final table bubble officially loomed. It was Ryan Fair who burst the bubble of the final table when he was all in preflop with against the of Joel Micka. Fair was unable to improve and our final table was set. Jerry Wong came into the final table as a massive chip leader but quickly went on a roller coaster of a day as evidenced when he doubled up Danchev early in the day. While Wong's stack was massively fluctuating, it was Joao Nogueira, the man who qualified for this event through a $1.10 satellite, who became the first casualty of the final table. With the blinds at 50,000/100,000 with a 10,000 ante, Micka opened to 200,000 from the cutoff. Nogueira shipped all in for his last 1.375 million from the small blind and Micka called. Nogueira was looking for an ace but did not find it as the board ran out . Despite being the first eliminated, Nogueira will forever have the incredible story of turning $1.10 into $165,000 for his spectacular run. Next to see his exit was Yann Dion who moved his short stack all in while holding . Jonathan Roy raised all in over the top with and was crushing Dion. Dion did not improve on the subsequent streets and was forced to settle for seventh place as he shipped his chips to friend and countryman Roy. Andrey Shatilov and Owen Crowe were the next to go in a spectacular hand that resulted in a double elimination. A short-stacked Shatilov moved in for his last 750,000 from the button only to have Crowe three-bet all in for 1.675 million from the small blind. Wong had both players covered and over-called from the big blind. The flop was of no help to anybody which meant that Wong retained his lead. The on the turn gave Crowe outs to chop but ultimately the on the river was not one of them. Shatilov began the hand with less and thus finished in sixth place collecting $325,000 while Crowe took home $435,000 for fifth place. A mere few hands later Roy saw his exit at the hands of Wong as well during a preflop five-bet confrontation. By absorbing Roy's chip stack Wong became the commanding force at the final table. It took just one level for Wong to lose most of his chips to his two opponents and seemingly out of nowhere he found himself all in and at risk. With the blinds at 60,000/120,000 and a 10,000 ante, Micka opened to 240,000 from the button. Wong three-bet to 650,000 and Micka called to see a flop. The dealer spread out and Wong continued for 725,000. Micka raised him all in for about 3.5 million more effective and Wong snapped him off. Wong's aces were out in the lead, but Micka was drawing quite live. He picked up even more outs when the fell on fourth street. Micka did not make his flush on the river, but instead made two pair with the and just like that the chip leader coming into the final table saw his ultimate demise. Wong took home $725,000 in tournament winnings and his elimination thrust the remaining two into heads up play. Micka began heads up with a chip lead that was quickly relinquished when Danchev was able to win a crucial race situation for his tournament life. This double up brought Danchev into a slight chip lead and he continued to lean on Micka for the rest of the match. With the blinds at 100,000/200,000 with a 30,000 ante, the battle finally came to a head when Danchev opened to 400,000 on the button and Micka three-bet shoved all in from the big blind for 6.675 million. Danchev called and the duo was off to the races. Danchev jumped into the lead when the flop fell , pairing his ace and thus putting him only two cards away from a championship. The fell on the turn and the on the river, sealing Micka's fate and writing history for Danchev. Micka's second place finish earned the online grinder a payday of $1,190,000. That does it for our coverage of the 2013 PCA Main Event! Be sure to stay tuned to our coverage as the $25,000 High Roller concludes the 10th anniversary of the PCA! 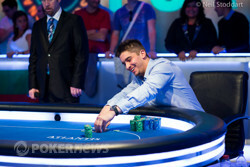 Dimitar Danchev raised to 400,000 on the button and Joel Micka three-bet shoved from the big blind for 6.675 million. Danchev called immediately. The flop was a disaster for Micka as it came down , pairing Danchev and leaving Micka drawing to one of the two remaining fours in the deck or running straight cards. The turn left Micka two outs to survive. The river was not one of them, ending Micka's Main Event with a runner-up showing for $1,190,000. Joel Micka raised to 400,000 on the button with and Dimitar Danchev defended his blig blind with . The flop fell and both players checked. The turn followed and Danchev bet 425,000. Micka called and both checked the river. Danchev took it down his his threes to take about a 3:1 chip lead. Dimitar Danchev limped on the button with and Joel Micka checked his option with . The flop fell and Micka put in a check raise, making it 475,000 to go after Danchev bet 200,000. A call from Danchev landed the turn which both checked. They did the same on the river and Danchev took it down with a pair of aces. Joel Micka raised to 400,000 on the button with . Dimitar Danchev called from the big blind with and a flop fell. Danchev check-called 325,000 on the flop to see the turn where both players checked. The river completed the board and both checked, with Danchev's ace high taking it down. Dimitar Danchev opened to 400,000 on the button with and Joel Micka called from the big blind with . The flop was a doozy as it came down . Micka checked to Danchev who bet 350,000, but Micka popped it to 850,000. A call from Danchev landed the turn where Micka bet 1.5 million. Danchev called after a few moments and the hit the river. Micka shoved for 4.91 million and sent Danchev into the tank for about 60 seconds before he folded. Joel Micka had the button. He looked down at raised to 400,000. Dimitar Danchev held and made the call. The flop brought and Danchev checked to the raiser. Micka continued for 400,000 and Danchev quickly check-raised to 1.1 million. Micka got rid of his cards and Danchev took it down.